NEW DELHI: Days after a green NGO expressed concerns over the ongoing fogging drive to deal with dengue problem in the city, Union Health Ministry today justified the preventive measure taken by the government, saying adult Aedes mosquitoes can be killed by such a method. “Adult Aedes mosquitoes can be killed by fogging. Fogging is recommended only in case of outbreak/epidemic situation to contain the upsurge in dengue cases. This has been the principal method of dengue control used by most countries as per WHO during outbreak situation,” Health Ministry said in a release. The viral disease is transmitted by bites of adult female Aedes mosquitoes. 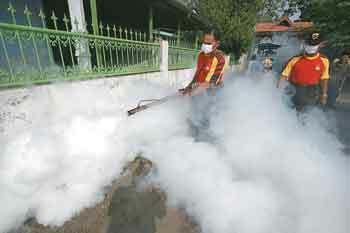 With a view to control the recent upsurge in dengue cases, fogging was resorted to kill adult mosquitoes by prioritizing the areas with high larval density as well as reports of cases coming from affected areas, it said. So far, dengue has claimed 32 lives in over 12,500 cases officially reported in Delhi. CSE had on Tuesday claimed that the ongoing fogging drive in the city was “not effective” in fighting the vector-borne disease, and has rather “harmful” effects on health, as the gas contains “95 per cent” of diesel in it. Saying that fogging only creates a “false” sense of security and was a way of “appeasing” people at the cost of their health, CSE had urged the government to focus on systematic preventive measures towards clean environment and sanitation. The Health Ministry, however, said that it has also been documented by WHO that in several countries, Aedes mosquitoes has been controlled thorough fogging at an interval of 1-2 weeks. Moreover, fogging is recommended usually at dawn and dusk because temperature is cooler and adult Aedes mosquitoes are most active at these hours, it said. Stating that even though diesel is used in fogging as carrier for insecticide, the release said that the temperature at which the diesel mixed with insecticide comes out as fog is less than the burning temperature of diesel as is the case in diesel driven vehicles. This can be noted from the colour of the smoke, which is white in fogging and black in vehicles. The white fog which dissipates quickly is usually not harmful and recommended to control much more serious public health hazards like dengue, the release said.